A haunted, haunting examination of mental illness and murder in a more or less ordinary American city. The small ghosts of debut author Tillman’s title are those of three young children, innocent of any wrongdoing, who were killed in March 2003 by a drugged, arguably insane young man, the father of one of the victims, and his common-law wife. And not just killed: apparently convinced that the children were possessed, John Allen Rubio stabbed them repeatedly and decapitated them. Not for nothing is one of the chapters titled “Don’t Read This Chapter Before Going to Bed”: the facts of the case are horrific. 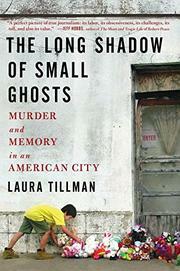 A journalist working in Brownsville, Texas, when the case occurred, Tillman writes of her initial reluctance to engage the story. “I had never been drawn to tragic crimes,” she writes. “Like many people, I pushed them out of mind when I could. It was easier to box them up and store them on a mental shelf of humanity’s worst moments.” Moreover, the media plays these tragic crimes for a time and then shelves them, moving on to the next atrocity. But what of the actors in the crime? Tillman looks deeply into the life and mind of Rubio, with whom she corresponded as he idled on death row, alternately convinced that he was the hero of the piece and aware of his guilt. The author raises or intimates difficult questions as she hears out Rubio, whose insanity defense was unsuccessful: what is it about our kind that makes us do such awful things? How does a community where an awful crime has been committed work toward healing after the cameras have been packed up and the reporters’ notepads put away? How much compassion does a mentally ill person who has murdered deserve? Tillman’s narrative, mature and thoughtful, eventually forces readers to examine the justice of the death penalty itself. A Helter Skelter for our time, though without a hint of sensationalism—unsettling in the extreme but written with confidence and deep empathy.